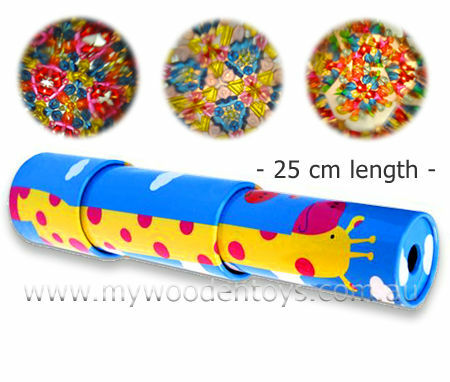 Telescopic Tin Kaleidoscope is a beautiful kaleidoscope made from tin and decorated with a happy giraffe. This kaleidoscope is telescopic which means when you pull on the body it becomes longer like a telescope. This kaleidoscope works by turning the end. As you extend the Kaleidoscope the lovely giraffes neck becomes longer. We like this because: "Very beautiful patterns. "